Rocks or kelp ground that snag your lead weight or hooks can be expensive in lost rigs and sinkers. You need a method of getting your rig and, hopefully, a hooked fish back, but you have to accept you may lose the lead weight. 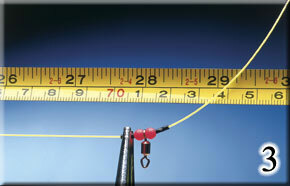 Rotten-bottom or weak-link rigs come in various guises, including some simple systems sold in tackle shops. You need something that will not release during the cast and it is not difficult to make your own for short-range fishing into rocks or kelp. I use an upturned Gemini Genie clip at the bottom of my main trace body; the snood connected to the trace body will hold one hook or a Pennell. Never use this system for power casting. Like all release rigs it needs to hit the water as close as possible to the vertical and there must be some slack in the line to allow the lead weight to come off the Genie clip. If you keep the line tight during the final stage of the cast, I cannot guarantee that the weight will release at the moment of impact wth the sea. 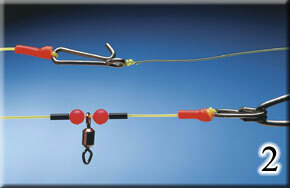 The simplest rig for fishing on rocks is a single paternoster carrying one hook. Uncomplicated and simple to make, the single hook means the minimum chance of snagging. 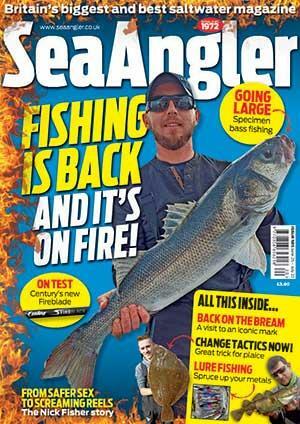 However, if you are using a large bait then the two-hook Pennell rig arrangement is superior. Here I’ll show you how to make a simple Pennell rig with a weak link. 1. Components are a size 2/0 oval split ring, Gemini Genie clip, 60lb trace body, 6-10lb line for the weak link, 25lb line for the hook snood, two beads, two crimps, snood swivel, two size 1/0 Kamasan B980 hooks and some rig tubing. 2. Tie the oval link to one end of the trace body. Slide on a small piece of rig tube to protect the knot, a crimp, bead, swivel, bead, crimp and another piece of tube. Now tie on the Genie clip, but attach it to the bottom rather than its top eye. Push the rig tube down to protect the knot. Tie on a weak link of 6-10lb line. 3. Nowposition the snood swivel. With a 24in snood, place the swivel about 28in up from the Genie link. Nowtigthen the crimps to fix the position, then tie on a length of 25lb snood line to the swivel. Slide on the top hook then tie on the lower hook. 4. Using the rig is simple. Tie the lead weight to the weak link, then slip the loop of the lead weight over the Genie link. It can be used for light overhead casts with the sinker releasing from the Genie as it hits the water.